Had first ride today. Linked brakes were a bit odd and almost non-existent. Full pedal travel. Did work but not the best. Took my time and gave myself lots of room. Bled the linked brakes first thing when I got it home. Brakes are better but need to be bled again. Have read that these are notorious for being softer than one would expect. Will be tackling these over the next couple of weeks - thinking need to be bled a couple of times to get the air out completely - fluid was also turning a bit syrupy. Think a lot has to do with sitting and not being used, and the pads are approximately 50%. Right front next on the hit list, then the clutch. Tire pressure was checked late this afternoon. Standard Honda specs - will be keeping the tire pressure at 40-42 PSI. This will be the last set of tires to use external weights. Ride was quite nice though. Will have to read up on the air suspension and how to set it as it was a sometimes harsh and didn't absorb the bump(s). Even so, suspension upgrade before next year will be in order. Took the foot board and heel/toe shifter off when I got home - prefer the OEM pegs and shifter. Took it for a ride early evening and the headlight is much better than the 1200. It has a daytime modulator. The PO has added the ring of fire on the front, lighting under the saddlebags. lighting around the front engine guard, and small spots under the front fairings. Need to do a picture and post. Asked Sonya to come look, I would not have done this but the lights are there, guess I'll live with it for a while. Will also check to determine which lights are LED. The PO mentioned that he had replaced the alternator, but with the OEM 40 amp model. Miss the gear indicator of the 1200. Remember this from my ex-1800. Have read about mods on line. Will be looking into this. Also want/need a voltage display of some form. Have the requisite oil light. 1200 has an oil pressure/temp indicator. Have ordered the shifter brace from Cyclemax and received an interesting email back from Randy at Cyclemax. The payment and shipping addresses were different so they segregate these, do some research and send an email requesting confirmation that all is well - an extra security step that I don't mind, but first time I've had this issue. Good on them for doing this. Lots of play in the shift lever and I believe the oil seal is FUBAR and needs replacement. Ordered the shifter brace with the shifter oil seal. Seat position for a 6'2" fellow is quite comfortable and with highway pegs, allows one to move around a bit. Found the 1500 a bit more solid in the corners than the 1200. The 1200 has some flex in the front that can affect the rear travel as well. Good torque that allows one to not be in the appropriate gear, much like my ex-1800. It likes fuel a lot more than the 1200 does. Will be putting a few tanks through with Yamalube Ring Free additive to clean out the system. Expect the engine to operate better as it gets used more. Found it to be quieter than the 1200. Extra couple of cylinders makes a difference. Sonya had a sit this evening and with the adjustable passenger foot boards found the seating quite nice. She's looking forward to her first ride. The PO had changed the seat because it had a tear in the riders right side. The replacement is not the same colour so I'm going to find a shop to sew in a new piece. Also like the original seat as it is embossed with the Canadian Edition. When I do this may ask for a gel pad to be put in as well. Before we get into the should be done category, have a list of items that need to be addressed. Have a trailer hitch to install - not to tow a trailer - I use it for a small hitch receiver to carry a small box containing bike cover and small items like this. 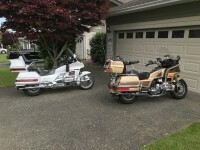 Gives a bit more room in the saddlebags and trunk. I'll probably think of more as I go. Out for a two up ride with Sonya. Had the air up to about 2.5 kg/cubic cm (about 36 pounds). Worked well. Bike was extremely well behaved and stable with the two of us on it. Having done some 60,000 Kms on my ex-1800, I would have to say that right out of the box with what I would say is a tired suspension, this 1500 actually rivals the 1800. This 1500 holds a line very nicely, and is not affected by lines in the road. Lots of torque for acceleration. I can see why a lot of riders do not want to upgrade. Find the seat and ergonomics of the 1500 cockpit quite nice. The seat is comfortable. Would like to have a shift indicator. Will take a bit of time to get back to knowing what gear I'm in depending on speed and RPM. Have bled the brakes and will be doing the same for the clutch. Have ordered a new air filter and the sub and cruise filters as well. Be buying new plugs, ordering up timing belts and possibly new timing belt idlers. Fuel filter is probably a good item to replace as well. Will do a screen over the air intake as well. Want to put together a maintenance package that will take advantage of having the plastics off. Glad to hear you're making serious progress! It was great talking to you the other day, by the way! 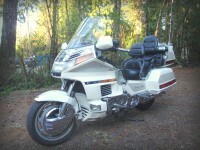 Sorry if I got long-winded...I'm passionate about my GL1500! No worries - received a lot of good information. Quite impressed with it. This one has 153K on it, but not worried/concerned. Engines, if one were to be required, are more available than for a 1200 FI model. Ordered new timing belts, fuel and air filters. Shifter brace ordered and on way. Oil change in the very near future as well. Debating on the suspension upgrade, not that I won't do it, but when. All too often these major items are done then you get rid of the bike, car, house, whatever. Forks probably do need an oil change, and a rebuild is not that difficult. Rear shocks, ride quality, performance and safety, suspension is the only item on the bike that keeps the rubber firmly planted on the road. The PO had replaced the original seat but it came with the bike. Have to find a shop to do some surgery for me. Next spring new tires, Elite 4 front and back I think. Ther’s a guy I used to deal with for motorcycle upholstery, had a shop in Victoria called “Top Stitch”. He did great work, at a reasonable cost. There’s a shop in Duncan now by the same name, and I’ve been told it’s the same guy. Might be worth checking out. I just had some work done at Tommy’s in Victoria. Nice work, but $$$$$!! Just back from a short ride up island of some 300 Kms or so and thought I'd do some pontificating on the 1500. Thinking back to my ex-1800 and how I used to get pinched between the shoulder blades and how close my knees were to the front fairing, I'm pleasantly pleased that the 1500 straight off the floor has lots of room for the legs and has a better ergonomic fit than the 1800 for us taller riders. I found this to be true of the 1200 as well. I checked the fuel economy today as well. So far city/highway is approximately 14/15 Kms per litre and on the highway 16 Kms per litre (with a bit of fooling around stretching the RPMs a bit). Won't go into conversion because the USG is smaller than the imperial gallon. Hoping that this will improve as I use the bike. The stock seat is quite comfortable as is. The seat covering is starting to show its age and where the embroidered stamping is there are a few small holes. Have been looking at replacement covers - quite reasonable. I'm sure you've heard this before but the 1500's simply LOVE gasoline if you are running over 3000 RPM. Best fuel economy is getting into OD as soon as possible, 1500 has plenty of torque, even in 5th gear. My average economy is 32-36 MPG. Let's see, Imperial gallon is 5 quarts, not four. And Miles to KMs. Hm, Think I'll just do KMs/l. 13.6-15.3 KM/l. Average driving a mix of City/Freeway, half of the freeway driving unfortunately is stop-go. Worst economy on a tank of fuel was 27 MPG (11.4 Km/l), this was 2-up, pulling Camper trailer at 550 Lbs (250 Kg) down interstate freeway at 80 MPH (130 KPH). Yes, I had read about the 1500 liking fuel, and that going past 3000 RPM was an approximate magic number. This is one reason why I like fuel injection. Too bad, as has been commented in several threads, that Honda never put FI on the 1500. I am looking forward to next spring when I have the 1200 heads done and hopefully a lot more compression in the old 1200 to see the difference in performance between the two bikes. I'm thinking the 1200 will get the same if not a little better fuel economy than now. Once in the 80 to 100 KPH range, I'm thinking the 1500 even with the better torque will have a hard time against the 1200 because the 1200 will be in the power band. Nice to have options. Right now keeping the 1200 in working order because there is some maintenance I want to do to the 1500 to get it to where I want it. Great bikes to keep a person busy. Shifter Brace showed up from Cyclemax today with shifter oil seal. Expected something a bit larger, but as long as it does the job. Picking up air filters and the front fork kits as well this week. Should have the fork springs and new air shocks by end week as well. Next week will be installing all the parts. Will also look at doing the air dryer desiccant while I have the rear off. A friend has been window shopping and looking at GWs. We've had a good chat about the 1500/1800 pros and cons. He has a Triumph Rocket III touring and had a bolt in the internal shifter mechanism come loose and drop into the sump, no damage to the bike. While the motor is apart he is also changing the stator. A few of the windings are blackish in colour. Back to the GW issue, we have discussed pros and cons, and for us taller riders, he's 6'4" or so, the 1500 stock off the floor is a better ergonomic fit than the 1800. Huge issue when touring, or riding in your neighbourhood. Yes you can get an aftermarket seat, or have the seat customized for the rider, but for us poor Canadians this is not a small feat considering exchange, duty and other issues. We had a good chat and he has decided to stay with his Triumph. He was concerned about reliability and I mentioned there are no guarantees with new, newer or older bikes. The best you can do is keep everything in as good condition as possible and role with the punches so to speak. Back to my '95, looking forward to getting the work done and enjoying the fruits of my labour. Looking for a CT for my 1500. Can get the Austone 175R16 out of Ontario for $224.00. Checked the difference between this and a US purchase and with exchange about $10.00 difference, but haven't added duty/taxes/shipping. Will be on the shopping list before next year. The company is out of Hawkesbury & Vankleek Hill, Ontario, Canada. The company does ship. 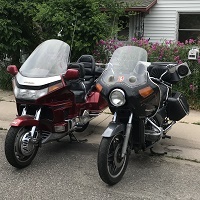 When I sold my second '85 LTD, I listed everything I did to the bike because it would help in selling the bike more quickly, and to me it's full disclosure. My 1500 has some good upgrades and I'm not thinking about the lighting. I would have thought that the PO would have informed me of these. Here's the kicker, there is an aftermarket Superbrace fork brace installed, it has progressive fork springs as well. When I found the Superbrace, I started to think that maybe PO to the fellow I bought the bike from had done some additional good work. I mention this because if the fellow I bought the bike off had done this work, certainly he would have mentioned it as a selling feature. Thankfully the rear shocks are OEM. Only have to figure out what to do about a second set of Progressive fork springs. Since the bike has been fairly inactive for the better part of 2 if not more years, changing out the Progressive springs for new may be the way to go. Will contact the company to see about a return as well. Will measure the old springs against the new for length. New air filters in today as well. The main, sub and cruise filters. New fuel filter to install tomorrow. Took the front end off today to rebuild the front forks and to prep the forks for new springs. Doing the timing belts and timing belt adjusters as well. Coolant flush, shifter seal, and shifter brace. I would submit that main air filter change on the 1500 is the easiest to change. Definitely easier than the 1800. I would also say it is easier than the 1200 because of space limitations of the 1200. Notice that the 1500 front forks do not have a locating clip on the forks like the 1200. The OEM service manual mentions that you "align" the upper surfaces of the fork tube and fork top bridge. Like the locating clip on the 1200 better. Notice that there is an extra piece on the left fork called an oil lock piece. If it is supposed to be on the right as well, it was not installed last time these forks were apart. Any information on this would be appreciated. These need to go. Need to install OEM style connectors for ease of removing panels and such for work/maintenance. Also found some small damage on some panels. Need to get some ABS cement for repairs. Turning into an interesting project. Looks likes the filter was doing what it is designed to do; however, don't believe it has been changed in a while as I was told. Installed the shifter brace and new shifter oil seal as well. This took the rest of the afternoon. Spent an inordinate amount of time getting the shifter shaft extension - not a lot of room to take this part out. Had to have the moon and stars aligned properly. The new Progressive springs are about a 1/4" longer and there is a distinct change from the ones I took out in that the Progressives ave a distinct transition from a progressive winding to the more tightly wound section. Will be looking at the rear shocks tomorrow. Dumped the coolant today. Looked quite murky as if it had been in the engine for a while. Have to say that I think a coolant change on the 1500 is the easiest between the 1200/1500/1800. Going to get the front forks back together and ready for install tomorrow. Will install after the timing belts are changed. Lots of room to work on the timing belts with the front forks removed. Not a day for bike work, but did get a few minutes in this early evening. Readjusted the shifter position, did not like where I had it. Also took less time to take the side cover and shifter extension shaft out. First time round always takes a bit longer. All for now. More to follow. Doing some research on the oil lock. In essence it is an oil flow restriction part. You can see in the pictures how the oil will flow faster past the damper tube without the oil lock than with the oil lock installed. It is position sensitive rather than speed sensitive. It alters the compression dampening in the last 10 mm or so of fork travel. A volume of oil is captured by it and must be forced through the gap made by the fork tube and the lock piece, or the pressure tube and lock piece, similar to a low speed valve. This circuit overrides all other compression damping, and the other circuits function only when the lock piece allows the fork to move (courtesy of Peter Verdone web site - https://www.peterverdone.com/archive/oillock.htm). This oil lock is only installed on one of the fork tubes, not both. looked for information as to which fork tube it is installed in and cannot find anything, would have thought the OEM service manual would have specified. Looking at the design and what it is to do, I don't believe it really matters as to which fork leg it is in. One site I visited mentioned that Honda may have changed which fork leg the oil lock was in. For right now, the only picture I have seen of which fork leg this is in is the right fork leg. It appears to be a good design for a street bike and assists the anti-dive aspect of the system. Today was a no work day, but I have been perusing the forums to gain further insight into my 1500. Have found and bookmarked topics for engine, frame, electrical and lighting to name a few. Lots of goods information and a way ahead to ensure trouble free riding. One of the issues I had read of before I purchased my 1500 was the alternator size and failures. In doing research into this found that LActrical and Compu Fire alternators were alternators of choice. I can find the Compu Fire 90 amp unit at some $400.00 CDN, but the LActrical is more illusive. Have found a 90 amp HO alternator from BB Electrical for $214.00 CDN and free shipping: https://www.amazon.com/dp/B00DV2EGNG/?tag=goldwingdocs-20 ... ad7924ad_S& This is on my order list along with other items such as an additional accessory fuse block and grounding strap to clean up what has been retrofitted. The fuse block I am leaning towards is from Eastern Beaver: https://www.easternbeaver.com/Main/Wiri ... /pc-8.html Have used this and installed it on two bikes, my friends Triumph RIII and on the '85 LTD I brought out from Ontario (have since sold). The timing belt adjusters came in today and will pick up tomorrow and finish up the front end install after which I will turn the bike around and do the rear maintenance including install of new Progressive air shocks. Unfortunately Honda has left the placement of the oil lock fork out of the instructions. Another day of not working on the bike, but did have a good afternoon at the local theatre watching a live production of "Grease". Lots of good tunes and an interesting take on the 1978 movie and 1971 live theatre production. Lots of gray hairs on hand. Not all was lost. Picked up the new timing belt tensioners, 15 wt fork oil, and some deionized water to mix new antifreeze. Have all the necessary parts to install and put the front end back together starting tomorrow morning. Picking up the new plugs tomorrow afternoon. Also ordered a 90 amp alternator from DB Electrical. Have read that the alternator is a weak point of the 1500 electrical system. Will travel with the 40 amp I take off as a spare - doesn't take up that much space. Was looking on line at 1500 issues and apparently there was a relay used in the fuel pump circuit on the '88-'89 15002, but Honda rewired the later models so there is no relay in this circuit. This has been known to impact on the ECU so I will be looking into the change to assess what I need and where do you put a relay if installed. Work starts tomorrow morning. Hope to have front end all buttoned up by Saturday night. Judging by the number of posts about it on this and Saunders site I'd say ECU Fuel Pump output failures are extremely rare. And even if it does, ECU is repairable, not potted solid internally like some "black boxes", solder in a new garden-variety T03 package output transistor and you are good to go. If you really want to add relay, just use existing power wire to pump to energize relay. Just an added failure point if you ask me... BTW - Ignition coil drive transistors in the ECU are also replaceable. Thanks. Have been reading the posts on an ECU failure, and how it can be repaired. Quite different from the ECU on my '85 LTD. Have other items I want to address first such as the wiring for all the coloured LEDs, not my cup of tea, but I will leave these there for now. Need an additional accessory fuse block to add certain items. Lots of good ideas for this. These older bikes are great for learning and learning new skill sets. Had no issue with the '85 LTD as I am fairly good at wrenching - ex-pump kicker from the Navy and spent countless hours in Father's service station. Enjoy electrics, but now there is the electronic component. It's like going back to school again. Going to turn into what we affectionately called the radar, comms and ops room types in our Navy - a Radio Lady. Had a lot of fun and good times when I was in. Getting up to speed on this will now have to wait as I have the parts needed to put the front end back together and it's wrenching time in the garage. Got some work done today. Timing belts and adjusters installed. Front forks rebuilt and installed - hopefully the alignment is good. New coolant as well - old stuff was a bit murky. Front back together. Really do hate all the plastic, but a necessary evil. Will finish plastic install tomorrow. Only work left on front is new brake pads when received. Checked the tires - in good shape; however, date stamp is 4207. The PO did not do a lot of work on this bike. Also using ABS cement on cracks and such. New tires are scheduled for this fall - will also do brake pads at that time. Think I'll take a break from work now, and just do a bit of riding. Have some other items I need so I will work on getting them over the next month or so. Looking forward to riding with the new Progressive springs in the front. Should be a difference along with new bushings and oil. Really do hate all the plastic, but a necessary evil. Will finish plastic install tomorrow. Finally got the 1500 put back together, the installation of the plastics on an older bike can be a chore unto itself. Nothing fits as it did new and have to make sure that wiring and such are out of the way. Had to backtrack several times to get the plastic(s) installed properly. Also using ABS cement on cracks and such to ward off breakage. Took it out for a road test, primarily because of the front fork rebuild. Before I did the rebuild had some 600 Kms on it so I was familiar with how the suspension was working. Not a lot of life left in the front suspension, even a small bump at speed or when going slow would be a harsh hit, not all the time, but more often than not. With the fork rebuild, new oil 15 wt, and Progressive springs (new OEM would have improved the front forks significantly as well) the front forks worked significantly well. The PO or the one before him had installed a fork Superbrace that helps as well. I used to watch the front forks to determine the amount of movement when riding but there was very little. Today when watching there was a significant movement in the front forks, lots of absorbing small and larger bumps/road imperfections. Totally different front end. Well worth the investment. Installing new fork springs is a good investment, and ride quality and bike performance will be improved. Looking forward to installing the new rear air shocks. Only item(s) left to do to the front end are brake pads, and wheel bearings. Steering stem bearings will be done down the road. Now to ride for a few days then onto the rear. Changing FD oil, lube all splines and new shocks as well as refurbishing the air dryer desiccant. Brake pads will be done all round when these get here. Ordered a 90 amp alternator for the 1500, should be here on Tuesday. Did this because of my perusal/readings on the various forums. In concert with this, I have been looking into the alternator and starter wiring. It's interesting that there is a 55 amp main fuse and the installed OEM alternator size is only 40 amps. To my way of thinking, there should never be an overload issue because of this, and with a 55 amp main fuse, I would have thought Honda would have at least a 55 amp alternator - more likely a 60 amp - installed to provide sufficient power for the 1500. If the electrical system is designed and needs electrical power up to at least 55 amps, a 40 amp alternator will only last so long. Will be ordering new alternator damper/rubber for install. I have been looking for a good connection spot to provide a 30 amp circuit for a new accessory fuse block and where to connect up a permanent voltage meter. From the wiring schematics I have and have seen, the alternator output goes directly to the main fuse. I will be looking at this wiring and connecting the new circuit and voltmeter where the alternator output wire connects to the main fuse. The wiring on the 1500 is probably similar to the wiring on my '85 LTD and should be left alone and not have any new load additions. I need to determine where the alternator sense wire is connected and may need to change this location as well to the input to the main fuse. If the sense wire is connected into the electrical system like it was on my '85 LTD, there could be a wiring loss of up to a volt or so. This voltage loss, if there, causes the alternator regulator to continuously require an alternator amp output higher than required to meet a 14.2 VDC system requirement. Not good for the alternator, or the electrical system. I mention using the connection to the input of the main fuse as the connection point for all new electrical circuits because this point will now become a distribution junction. 98% of the power generated by the alternator at any given time is used by the bike to power the electrical system. The battery once the engine is started, and the battery has been replenished to a 100% state of charge, only receives a trickle charge, and unless the voltage in the electrical system drops below approximately 12.6 VDC, is a light load on the electrical system. I will also be looking at a new ground bus as well for new electrical circuits. Have used a fuse block from Eastern Beaver: https://easternbeaver.com/Main/Wiring_K ... /pc-8.html that is a combined power and ground unit. Compact and works well. Has 8 ground connections, 6 switched power circuits and 2 circuits that are live at all times. The unit can be connected such that there are 8 switched circuits by using a small jumper wire. There are other fuse holder configurations such as a 3 Fuseholder for ATM Type Mini Blade Fuses by Delphi (Metripack 280) that I have used for low power circuits as well. I know there are other units out there, but the owner of Eastern Beaver is a Canadian ex-pat as well.Have to get me some more OEM style (Hitachi) connectors before I start any wiring. Before we get into a discussion regarding connecting new circuits at the battery or not, it is not my preference so I will not be going there. I will be following up on this as I do the maintenance on the 1500. One item I have moved and it was from a video WingAdmin did of his 1500, is the battery tender connection. I have tucked it into the right trunk pocket under the speaker. Out of the way but easily accessible, and I don't have wiring hanging out spoiling the look of the bike. Stopped in at the local Princess Auto to have a look at blade fuses. Found 60 and 40 amp maxi blade fuses and fuse holders. The fuse holders are 8 and 6 gauge wire. Providing the electrical circuits are protected properly a 60 amp blade fuse in place of the 55 amp dog bone fuse may be a good alternative especially if you are putting an HO 90 amp alternator on the 1500. Could also downside to the 40 amp maxi blade type fuse as well considering that the OEM original alternator is only 40 amps. Something to think about and an option for the dog bone fuse.